Um grupo formado por 48 estudantes de oito a 14 anos recebe informações sobre a missão da Osiris-Rex da Nasa, que enviou uma sonda ao espaço em setembro de 2016 para monitorar e coletar amostras da superfície do asteróide BENNU. A aula explicativa com slides fornece detalhes passo a passo de como a agência espacial trabalha para monitorar o solo e detalha os aspectos técnicos dos cientistas da Nasa, durante a missão. No encontro eles receberam robôs fabricados por impressora 3D com sensores arduinos (plataforma de prototipagem eletrônica). Os alunos aprenderam a programar os robôs pelos computadores e sentiram a sensação de comandar os equipamentos espaciais em uma superfície simulada, instalada em uma outra sala de aula. Eles também realizaram tarefas percorrendo labirintos utilizando a programação computadorizada (sem tocar nos robôs). Ao ver os objetos se movendo os estudantes ficaram encantados. O programa “The Asteroid Mission” é oferecido mundialmente pelo KSCIA para atrair as novas gerações e mostrar as possibilidades de carreira na área de exatas. “Nossa meta é motivar os estudantes. Se querem ser engenheiros da Nasa, precisam estudar para chegar lá”. disse João Carlos Filho, coordenador do projeto no Brasil. 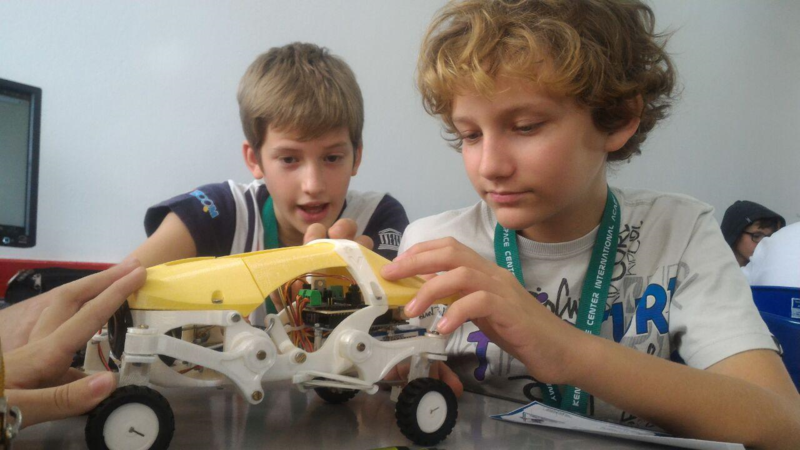 Luís Gustavo Rosa Bueno da Silva, do 3º ano, ficou entusiasmado com a programação dos robôs. “É legal porque a gente fica perto de coisa que você nunca viu”, disse referindo-se a programação. Charlotte Masutti, do 7º ano, ficou encantada com o programa e diz que fará de tudo para estar na próxima jornada. “Adorei desenvolver várias ideias aqui. Sou apaixonada por robótica e pretendo ir a Nasa em busca de mais conhecimento”, frisou. No Brasil quatro instituições educacionais foram selecionadas para oferecer o curso entre elas o Colégio Acadêmico. A programação prevê aulas com Vinícius Lopes, engenheiro mecatrônico, que foi especialmente treinado para a missão no Kennedy Space Center. O programa conta com parceria também da The Michaelis Foundation for Global Education e a Brazil Florida Chamber of Commerce. Embraer flew its first Legacy 500 midsize jet assembled at its assembly facility in Melbourne, Florida, on July 13, eight months after the first Legacy 450 mid-light jet assembled in Melbourne took flight. “The aircraft performed as expected and all flight-test procedures were successfully completed,” the company said. ​The Legacy 500 is the fourth business jet model to be assembled at Embraer’s Melbourne facility, after the Legacy 450 and Phenom 100 and 300. The Legacy 450 and Legacy 500 are also manufactured at Embraer’s production facilities in São José dos Campos, Brazil, though it said earlier this year that it eventually plans to assemble most of the Legacy 450/500s in Melbourne. All Phenom production was shifted to Melbourne a year ago. Embraer began assembling aircraft at its Melbourne facility in early 2011 with the entry-level Phenom 100, followed by the Phenom 300 in August 2012, the Legacy 450 in June 2016 and the Legacy 500 this past January. Over the last seven years, the company has delivered close to 250 Phenoms and Legacys, valued at about $2 billion, from its Melbourne facility to customers across the U.S. and to countries around the world. By Steven Siceloff, NASA’s Kennedy Space Center, Fla.
NASA last year awarded contracts to Boeing and SpaceX to each develop systems that will safely and cost effectively transport astronauts to the International Space Station from the United States. The CST-100 will be assembled and processed for launch at the revitalized Commercial Crew and Cargo Processing Facility, or C3PF, at NASA’s Kennedy Space Center in Florida. NASA had used the facility for 20 years as a shuttle processing hangar and for the extensive preps and testing of the space shuttle main engines in the engine shop. With the high bay of the C3PF expected to be complete in December 2015, engineers are building the structural test article for the Starliner in the remodeled engine shop. Though not scheduled to ever make it into space, the test version of the spacecraft will be put through a continuum of tests culminating with a pad abort test in 2017. It will be used as a pathfinder to prove the design Boeing and NASA’s Commercial Crew Program worked together to develop is sound and can accomplish its missions. NASA has selected J. P. Donovan Construction Inc. of Rockledge, Florida, to begin work at the agency’s Kennedy Space Center in Florida on the ground structures that will launch NASA’s next-generation rocket and spacecraft on the journey to Mars and other deep-space destinations. The Ground Systems Development and Operations (GSDO) Mobile Launcher Ground Support Equipment Installation contract is a firm, fixed-price contract that extends for 455 calendar days and has a maximum value of $45.8 million. Significant subcontractors are Core Electric of Melbourne, Florida; MDI Services, LLC of Orlando, Florida; and Bragg Crane & Rigging of Long Beach, California. J.P. Donovan Construction will install and integrate ground support equipment onto the existing Mobile Launcher to modify the structure with systems necessary to assemble, process and launch NASA’s integrated Space Launch System rocket and Orion spacecraft. GSDO’s primary objective is to prepare Kennedy to process and launch the next-generation vehicles and spacecraft designed to achieve NASA's goals for space exploration. To achieve this transformation, program personnel are developing the necessary ground systems while refurbishing and upgrading infrastructure and facilities to meet tomorrow's demands. This modernization effort keeps flexibility in mind, in order to accommodate a multitude of government, commercial and other customers. A new report says space travel startups have raised a staggering $1.9 billion since 2014. Venture capital database CB Insights released the report, titled "Future of Frontier Tech," which also says that drone startups have raised $285 million since 2014 and virtual/augmented reality companies $1 billion. Emerging companies in the space industry, ranging from launch vehicle developers to satellite services providers, have raised more than $2 billion from investors since 2012, although the vast majority of that funding came from just two deals earlier this year. A report released Aug. 28 by CB Insights, a New York-based financial intelligence firm, concluded that investments in space companies since the beginning of 2012 totaled $2.16 billion, including $1.75 billion in the first half of 2015 alone. An average of 140 satellites with launch masses greater than 50 kg will enter orbit by 2024, according to Euroconsult’s new “Satellites to be Built & Launched by 2024,” report. Of the 1,400 satellites over the next decade, the research firm expects governments from 60 countries will be responsible for 75 percent of the $255 billion in revenues from manufacture and launch. In comparison with last year’s forecast, the number of satellites is due to grow more than the market value over the decade. For as long Ron Jones could remember, he had spent his free time pondering the trajectory of space travel five, 30, 50, even 100 years down the cosmic road. To him, space travel was a cosmic Rube Goldberg machine. To reach the end goal—which he considered to be large-scale habitation of Mars—a thousand little things had to happen first. Things like creating reliable in-orbit transportation vehicles, mining asteroids for materials, and building a thriving community on the moon. Buzz Aldrin is teaming up with Florida Institute of Technology to develop “a master plan” for colonizing Mars within 25 years. The second man to walk on the moon took part in a signing ceremony on Thursday at the university, less than an hour’s drive from the Cape Canaveral Spaceport. The Buzz Aldrin Space Institute is set to open this fall. Jeff Bezos, the billionaire Amazon.com CEO and founder of private space company Blue Origin, will visit Cape Canaveral next month to make a "significant announcement regarding the commercial launch industry," according to a media invitation. The announcement is expected to confirm Blue Origin's intent to build rockets on the Space Coast and launch them from Cape Canaveral Air Force Station. The company has been negotiating a package with Space Florida and other agencies that would result in construction of a manufacturing facility in Exploration Park just south of Kennedy Space Center's secure area on Merritt Island, and eventual launches of orbital human spaceflight missions from Launch Complex 36. "I’d love to explore Mars, but, ultimately, it’s kind of a crappy planet," said Canadian astronaut Jeremy Hansen. "The thing is, [Mars One people would] never go outside without a spacesuit ever again. You’re going to live in a tin can. Space stations are noisy; it’s like living inside a computer with the fan on all the time. You’re never going to smell grass or trees. It’s just never going to be anything like Earth. You’re never going to swim. You’re giving up so much." When Apollo 17, the last manned mission to the Moon, left the lunar surface in December 1972, people on Earth seemed to check it off the cosmic to-do list. Been there, done that. The grey orb was dry and deadly, with freezing 14-day nights that dipped to –270° C and equally long days that reached a blood-boiling 100° C. Mars, meanwhile, was calling. Humanity’s interplanetary ambitions wandered elsewhere. Grounding human spaceflights was always supposed to be temporary as we made the necessary transition to a new generation of spacecraft, operated by American commercial carriers. Likewise, paying for seats on Russian spacecraft to send our astronauts to the International Space Station (ISS) was always intended to be a stopgap. We didn't finish the first one yet. We just abandoned it. "Nearly five decades ago we had the ability to extend ourselves into the solar system and beyond," Stephen Petranek says in his new TED book, How We'll Live on Mars. "We simply have not chosen to pursue the opportunity." The US House of Representatives took a firm stance on commercial space exploration when it passed the Space Resources Exploration and Utilization Act of 2015 (SPACE Act) in May, providing an opportunity for companies to get off the ground and embrace a new era of space pioneering. “I think that the SPACE Act is a watershed event in the nascent industrial resource space mining industry. Responding to congressional criticism that suggested NASA was giving SpaceX special treatment, Administrator Charles Bolden said NASA is conducting an independent review of the company’s June launch failure. In an Aug. 24 letter to House Science Committee Chairman Lamar Smith (R-TX), Bolden said the appearance of special treatment accorded to SpaceX over Orbital ATK was a “misunderstanding” because NASA is taking a different approach to reviews of the two companies’ launch failures. “First and foremost, I want to assure you that NASA is performing an independent analysis” of the June 28 Falcon 9 launch failure on SpaceX’s seventh cargo mission to the International Space Station under its Commercial Resupply Services (CRS) contract with NASA, Bolden wrote. After increasingly losing customers to SpaceX for satellite launches, Arianespace is planning to lower the cost per flight to about $96 million. This new price range could be implemented when the new Ariane 6 launcher is developed, which could deliver 11 metric tons to GTO, making Arianespace’s offer more affordable. The first flight of the Ariane 6 is currently slated to take place in 2020. “Unless the other rocket makers improve their technology rapidly, they will lose significant market share to the Falcon 9,” said Elon Musk, SpaceX’s CEO and chief designer. SpaceX is also expanding its portfolio by developing a heavier version of the Falcon booster. The Falcon Heavy should allow the company to send a record-breaking payload of 53 metric tons to LEO and slightly more than 21 metric tons to GTO for some $90 million.